Mustard Seed Theatre always has a few surprises up their sleeve and this sprightly adaptation of Charlotte Bronte’s “Jane Eyre” by Julie Beckman deals with the rather bleak story in an unconventional manner. Yes, Jane is still the orphan who’s mistreated at the hands of her uncle’s family and yes, she finds happiness with Edward Rochester only to have a mad wife and a fire throw a monkey wrench into her life- but the unexpected humor Ms. Beckman inserts into the story not only works, but it makes her dealings with such misery more hopeful than most renditions. The first thing you notice is that some stage directions and even characters thoughts become dialogue. After a while it doesn’t seem odd that Mrs. Fairfax announces her entrance and what she plans to do next. This and other touches of light-heartedness are a welcome addition to the story. Of course, you must have a strong Jane and nobody can deliver the goods better than Sarah Cannon. Every feeling is expressed through body language, facial expressions and voice inflection. With the audience being this close to the action, it’s marvelous to watch her work. Whether a sarcastic “throw away” line or intense pain and grief, Ms. Cannon’s emotions are laid on the line. As her Rochester, Shaun Sheley also displays a wonderful range of emotions. His dark, moody character comes through but a touch of whimsy adds beautifully to the mix. Donna Weinsting does everything but steal the show with her dual role of the cruel aunt and then a delightful turn as Mrs. Fairfax. She gives us a lesson in perfect timing with her delivery of lines and attitude. It’s a perfect performance. The rest of the ensemble also plays various roles to tell this vast story of tragedy and triumph. Most notable is Richard Lewis as a nasty schoolmaster, a minister and several other roles. B. Weller cracked me up with his perfect Nigel Bruce-like befuddlement as Act II opens with a ball at Rochester’s manor. Also in the ensemble are Gregory Cuellar, Katie Donnelly, Laura Ernst, Kathryn Hunter, Carmen Russell and Leslie Wobbe. Between establishing a series of believable characters, they also help the scene changes run smoothly and efficiently. And speaking of the set, Dunsi Dai has created a masterpiece with several levels and several areas that function as somewhere in the neighborhood of twenty or so places. Even high flying arches over both sides of the stage help set the mood. Michael Sullivan’s lighting design also adds drama and the JC Kracijek costumes are perfect period pieces. And two of the actors double on flute to provide some excellent period musical background to the proceedings. And, of course, the spot-on direction of Mustard Seed’s Artistic Director, Deanna Jent, makes this unusual adaptation work to perfection. 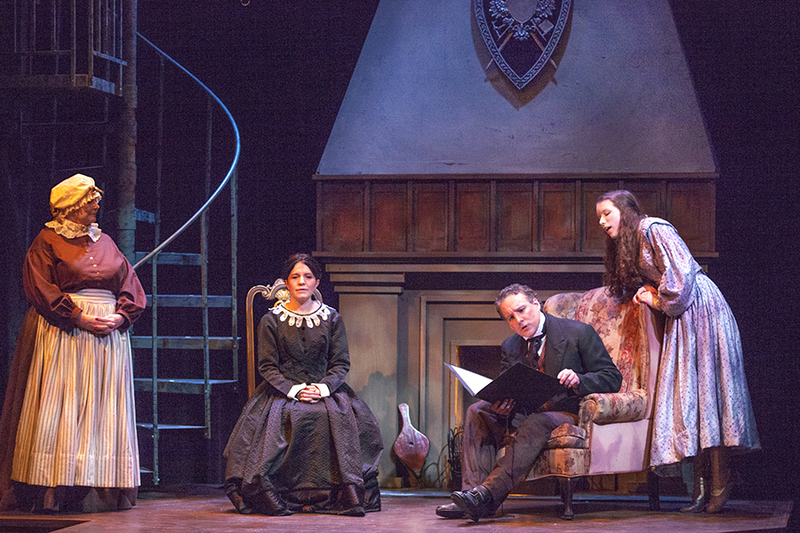 It’s a trip to “Jane Eyre” that you’re not likely to see again. A delightful balance of tragedy and winning over the hardships that befall her, this play is not to be missed. “Jane Eyre” runs through April 28th at Mustard Seed Theatre. Call them at 314-719-8060 or contact them at mustardseedtheatre.com for tickets or more information. This entry was posted on April 15, 2013 at 9:43 pm04 and is filed under Uncategorized. You can follow any responses to this entry through the RSS 2.0 feed. You can leave a response, or trackback from your own site.